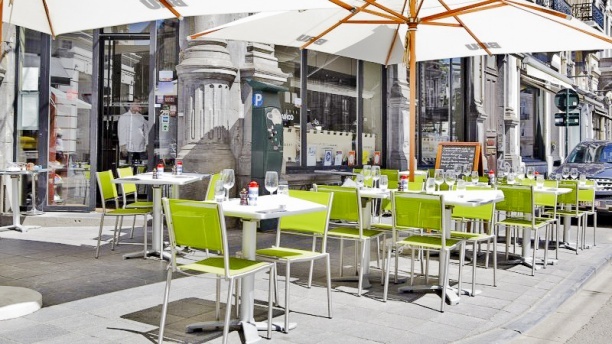 CLASSY & MODERN, located in the heart of Brussels, the brasserie style restaurant "Les Petits Oignons" is open 7 days a week. AFTER 30 YEARS and 1 ADDRESS CHANGE, the signboard offers classic dishes and great wines but also more popular dishes such as sauerkraut or mussels casseroles. I went to dinner with my girlfriend on Easter evening. I premise that my girlfriend is lactose intolerant and that at the booking, made a few days before, I wrote it very clearly and the waiters were informed when we arrived. I took the sablon menu (ouef poché, navarin d'agneau and soufflé glacé), which really matched with a michelin-guide restaurant. My girlfriend had not the same luck. When we ordered, although we had again specified the intolerance,the waiter claimed to have asked about what my girlfriend could eat. At the end, of all of the menu proposed only the salmon, as appetizer, and entrecote, as dish, were availables. Trusting the waiter we ordered theses two dishes. The salmon arrived with a cream that the waiter removed from the plate with a knife at the table, then inviting my girlfriend to eat the same. The entrecote came with a tuft of rocket and a saucer of French fries (practically a child's menu,all at a cost of 30 euros). We were really disappointed for a Michelin-Guide restaurant. Very nice brasserie, good ambiance. Good quality of food. Simple but high quality ingredients to prepare classical Belgian cuisine at fair prices. Service is friendly. Highly recommended. Excellent service, rich wine list. The dishes are certainly not disappointing but they are not remarkable either. I would go again. Consistent good quality and service ! Excellent. If I lived in Brussels, it would be my bi-weekly lunch spot. Wonderful New Year dinner! We opted for a la carte menu and it was great ! Main meals are not cheap - around 40 Euro, but very worth it!!!! The restaurant was absolutely packed and people kept coming even when we were leaving at 11pm. Book the place well in advance. Merci Les Petit Oignons! Friendliness is something which seems lost in translation over at this place. I would have expected better. This is one of my favourite restaurants in Brussels. Really friendly atmosphere and service, restaurant served quite a lot of offal dishes. The plates we ordered were cooked perfectly really nice wholesome, comfort food. A few of the diners appeared to be local, head chef came out and treated several tables. I was very satisfied with the dinner and look forward to returning. one of the best meals I've had in Brussels. Just to confirm I'm in Brussels 30+ times a year! Absolutely superb!